Forgiving to all thine iniquity, healing to all thy diseases. 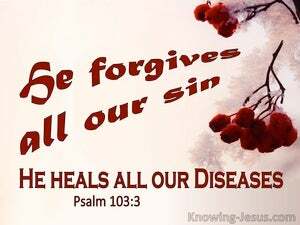 Who forgiveth all thy sin, and healeth all thine infirmities? Moses cried out to the LORD, saying, "O God, heal her, I pray!" O LORD, rebuke me not in Your wrath, And chasten me not in Your burning anger.